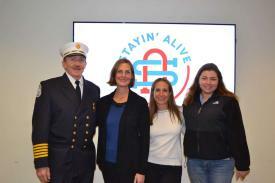 Stayin’ Alive charity grant award event. BIFD received a grant to purchase a Marsar ice rescue sled! Thank you Stayin’ Alive! GFD LT Bill Richardson III, Ex-Chief Bill Richardson Jr, Ex-Chief Martin Richardson Sr, FDNY Firefighter Martin Richardson Jr.